I have been practising like a demon and have finally come up with a way to make a mean loaf (or two) of relatively healthy bread. My ambition is to get it as low GI as possible without compromising on taste. I’m still a long way off that goal but edging ever-closer. I don’t know if any of you are nifty with a bit of dough (and I don’t mean at the Chanel counter) but if you’ve got any tips, I’m all ears! 1. Reactivate your yeast by stirring the yeast and sugar into your measured water. Make sure it’s not too hot… it should be slightly warmer than tepid. Leave for around 10 minutes, the yeast should have made the surface foamy. 2. Combine the flours and salt together in a large mixing bowl. 3. Add the yeasty water to the dry mixture and combine well before pouring in the melted butter/olive oil. 4. I use a hand mixer with two dough hooks attached at this stage and mix for 5 minutes on level 3. If you’re a traditionalist, get kneading for a good 10 minutes. I use the hand mixer because whenever I knead by hand, I always get tougher bread. Infact, I just bought a new hand mixer, it’s this one and I thoroughly recommend it. I paid £18 (not inc. p&p). Usually when sellers bump the price up like that it means that it’s temporarily out of stock. The price should drop back down as soon as they get new stock. 6. Cover the bowl with a tea towel and place somewhere warm for ONE hour. I put mine in the airing cupboard. 7. After an hour, turn the bowl onto a lightly floured surface and punch down to release the gas that’s built up inside the dough. 8. Give the dough a 1 minute knead/shape and place into a well-oiled bread tin. There are lots of videos about on how to ‘shape’ a loaf. I’m AWFUL at it. At this stage, sprinkle in the additional seeds that you may want to add. 9. Cover again and return to warm place for no longer than 30 minutes. I find this bread is prone to over-proofing and getting a flat top in the oven if I leave it any longer for the 2nd rise. 10. Pre-heat the oven to 200 degrees celsius (fan oven) and whack it on the middle shelf for 45/50 minutes. 11. Once cooked, you should hear a hollow sound when you tap the bottom of the loaf. Allow to cool before cutting, no really… as tempting as warm bread is – cutting it too soon is death to a home-baked loaf. The recipe above works out at around £1.04 a loaf – less if you stick to only wholemeal flour (up the quantity to 450g) and do without the seeds. There is something very special about turning out a freshly cooked loaf of bread and watching your family come to the conclusion that they never realised that ‘proper’ bread could taste so good. As usual, my version is kinda lazy and a little bit cheat-y. It’s not massively low GI but the use of wholemeal/spelt and the addition of seeds means that I ‘fill up’ quicker on smaller portions and it doesn’t spike my blood sugar *quite* as rapidly as plain old white supermarket bread does. I’m genuinely the kind of girl who could eat bread all day long and this loaf cuts very finely without disintegrating… I really get better portion control without feeling like I’m missing out. It also tastes a 100x better. This looks lovely. I bake my own bread, daily – my 2 girls (aged 2.5 and 5) would happily eat a whole loaf on their own if I let them! Or Foccacia ,which I’m drawing a blank on for quantities but will come back and post. Whoops! Forgot to add 275 ml of water to recipe. Fantastic!! What does the milk powder do? Add softness? Just a note with regard to the agave – I would try the loaf with sugar first to see how you go because the liquid nature of it can change the texture. Mmm sounds yummy! I’m going to give this a bash. White bread makes me look 18 months pregnant. I had a white panini for lunch today and when I got home I looked in the mirror and could’ve cried. I have IBS, so I should know better than to eat white bread……it is seriously bad news for me. If I bake my own bread it’s death by carbs because it tastes so much better than store bought that I end up eating the whole loaf. :/ So.. I stopped. Self control, I have none. 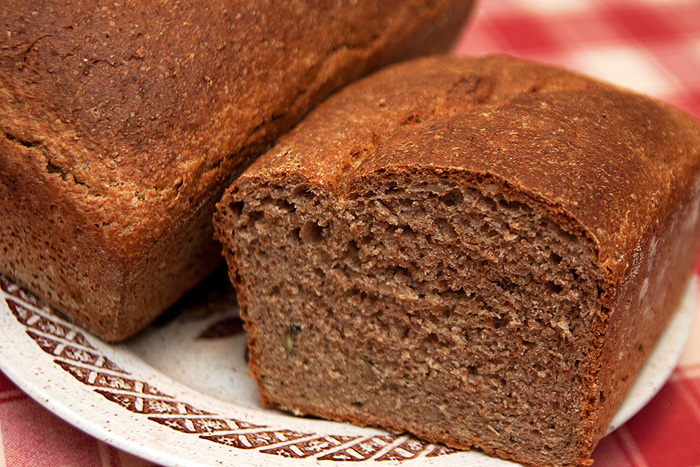 You should try making sourdough rye bread – it takes a while to bake, but it’s cheap, very filling, and healthy. My inner child still claims that this, and milk, is what makes you tall and fast! I think it’s an idea many Danes have a hard time shaking, even when we grow up. I mean, I always knew it was true! As a kid, I was sincerely baffled how the rest of the world even managed, without. Luckily, it also tastes great 😉 I think it has a low GI, at least according to my old bio-teacher. I already have a translated version, seeing as I live outside of my slightly dreary home country, and regularly foist sourdough and recipes on (other poor, malnourished, student type) people. 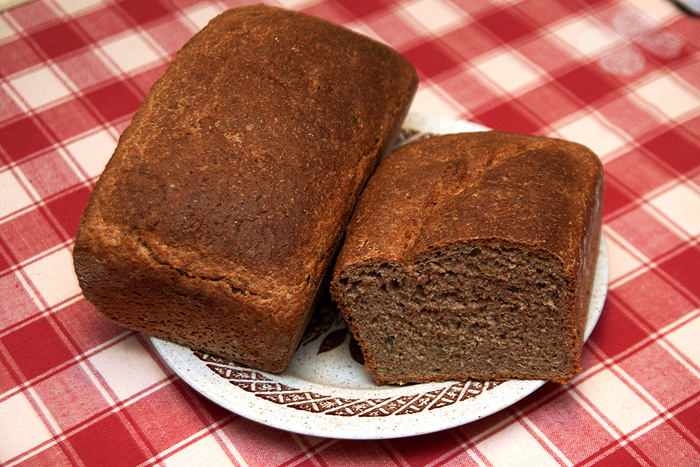 Mix: 200g wholemeal wheat flour + 200g wholemeal rye flour + 1 Tbsp salt + 1 portion sourdough + app. 5 1/2 dl cold water. Before anything else, take of a portion of dough for next time. Pour in 1/2 a kg of kernels (Preferably rye. Above mentioned baker uses only broken rye kernels, and I used to, too. I can’t get those in Germany, but it turns out whole kernels work fine – I thought they would be too hard. These days I mix it up a bit. 3/4 rye to 1/4 sunflower seed or linseed, or both, is really good. You can change the character of the bread a LOT with the choice of seeds, just do it by weight.). Add app. 2 1/2 dl beer – any kind. Mix, and pour into a (maybe slightly greased, if necessary) loaf pan. Drizzle a bit of veg. oil on the top. Leave to rise for app. 1/2 an hour. Bake for 1 h. at 100 C, with no preheating. After that, turn up to app. 200 C for 1h. 15 min. When it’s done, it can be a good idea to wrap it in a damp tea towel while it cools, to avoid it getting too hard.